Earlier this month, a bright-orange clingfish, Dellichthys trnskii, burst onto the scene – and it bears the name of our Head of Natural Sciences, Tom Trnski. New species living in New Zealand are described almost every day, so scientists are still lifting the lid on the undiscovered, unnamed micro-cosmos that lives in our soil, leaf litter and oceans. Indeed, Tom is not the only curator to share his name with a species, we have all number of staff in our Natural Sciences department who have a namesake from 'super cute' parasitic wasps to seaweed species. In this blog, we took the opportunity to ask them about their favourite biological namesakes and how they acquired them. Tom has recently been bestowed the honour of having a species named after him which has held the working name of “Terminator Trnski” since its discovery in 2016. This species of cryptic clingfish (Dellichthys trnskii) was captured by Tom in shallow water along the Tutukaka coast. It was the first live specimen to be collected which allowed genetic work to be undertaken to confirm that it was in fact a new species. The reason it once bore the name ‘Terminator Trnski’ was because the scientist who named it, Dr Kevin Conway, holds a deep fear of sharks. This shark-phobia meant he could only collect specimens in waist-deep water while Terminator Tom was happy to brave deeper waters. On this collection trip, Tom's ventures into two-metre deep water proved to be fruitful as he clocked this rare fish sucking onto a rock. He says that finding this fish came as a delightful surprise given that it was found in such shallow waters just metres off the coast. Over his forty year career, John has had eight species named after him – two wasps, two flies and four beetles. Of those species, he has a special place in this heart for a small wingless parasitic wasp - Maoripria earlyi. This ‘super cute wasp’ was discovered on a sweep of the ferns and mosses of the rain forest beside the Fiordland end of the Routeburn track, from The Divide to Key Summit. At the time John, who was working as a tutor at Lincoln University, sent his samples to a colleague in Australia who was researching the family of wasps to which this species belongs. He deduced that this haul contained several new species, one of which he named after John. 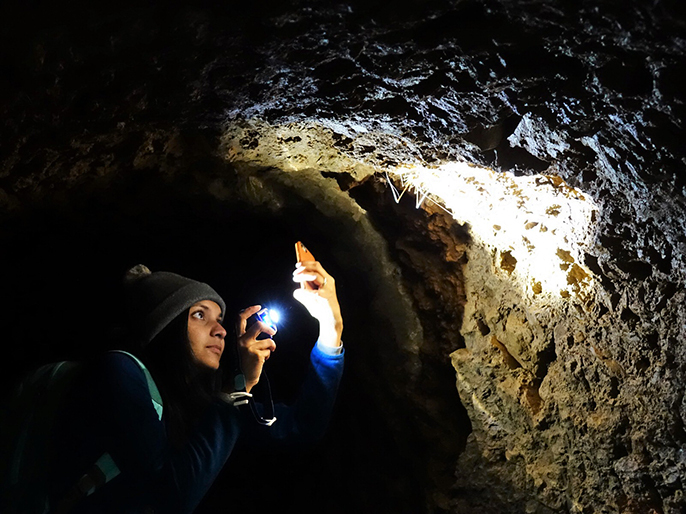 Despite the fact that it was named in 1988, mystery still surrounds what this litter-dwelling creature parasitizes though familial connections suggest it is the larvae or pupae of a small fungus gnat. During his career, John has named several species after colleagues, fictional characters (“It had a hunched back, so Quasimodo seemed to fit”), celebrities (“Greta Garbo fitted the bill because it was the only female”) and one after his professor. To which his lecturer replied, “Why did you name it after me? Was it the bald one?”. Ewen’s namesake is a small red seaweed (Gigartina ewenii) that he found on the intertidal shores of an island at Manawatawhi ( Three Kings Islands) in 1983, at a time when little marine collection had been done on this remote northern archipelago. It took 31 years before it was officially published as a new species in 2014. 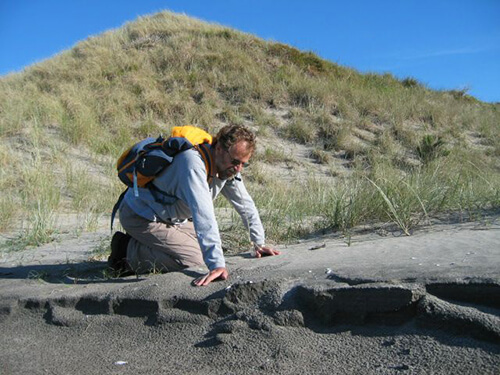 Like many of our curators, Ewen goes on several collection trips a year to islands around the Hauraki Gulf and beyond. With his magnifying glass always handy, he can often be found crawling through the leaf litter in search of interesting new plants. Indeed, some of his singlets are worn through in the space where his magnifying lens hangs. 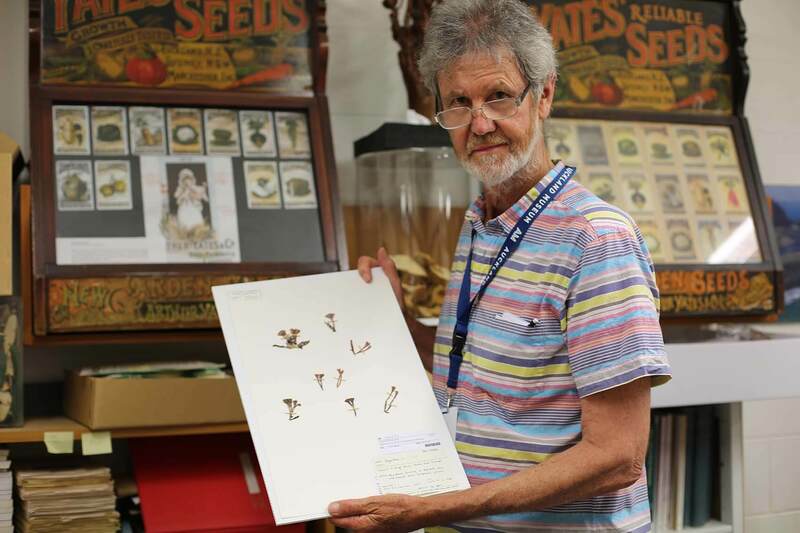 Each year he returns with several hundred specimens to add to Auckland Museum’s 400,000 strong plant collection. 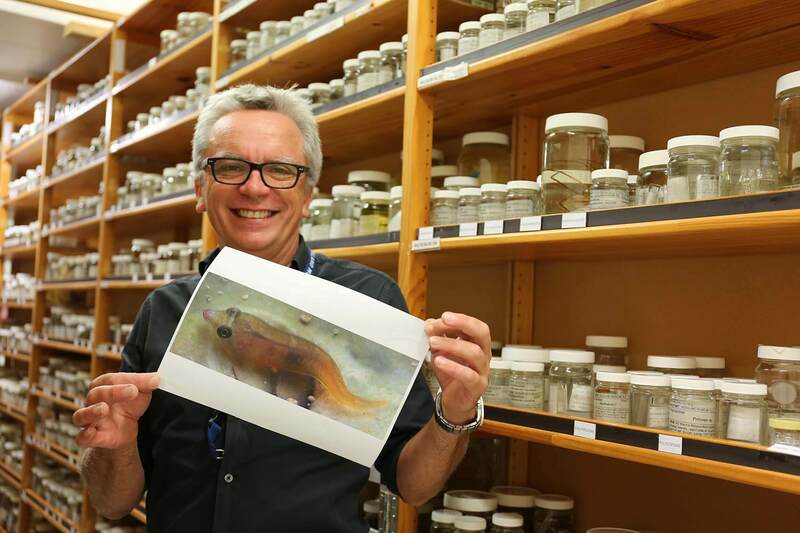 He has personally collected over 17,000 specimens. Ewen says botanical collection hasn’t changed much since Banks and Solander with collectors initially securing plants in field books although typically modern day collectors take extensive field notes, GPS drop points, images and detailed descriptions of surrounding species. 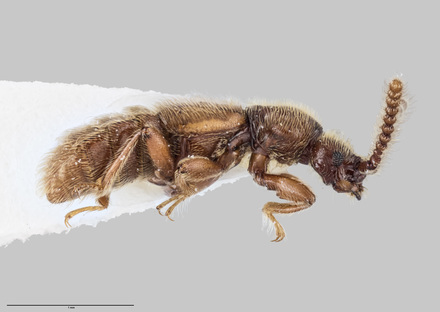 In January this year, Collection Manager Dhahara Ranatunga received her second entomological namesake – an alpine, predatory ground beetle that now goes by the name of Maungazolus ranatungae. 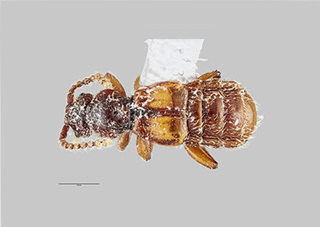 During her seven years at Auckland Museum, she has sent thousands of botanical and entomological specimens around the world to help scientists with their taxonomic research and as a result has been rewarded with a couple of beetle namesakes (Sagola ranatungae and Maungazolus ranatungae). It’s customary practice for museums like Auckland Museum to make their collections available to bona fide researchers. This reciprocal arrangement means that scientists around the world can tap into the vast collections at Auckland Museum and highlights their importance globally as well as locally. 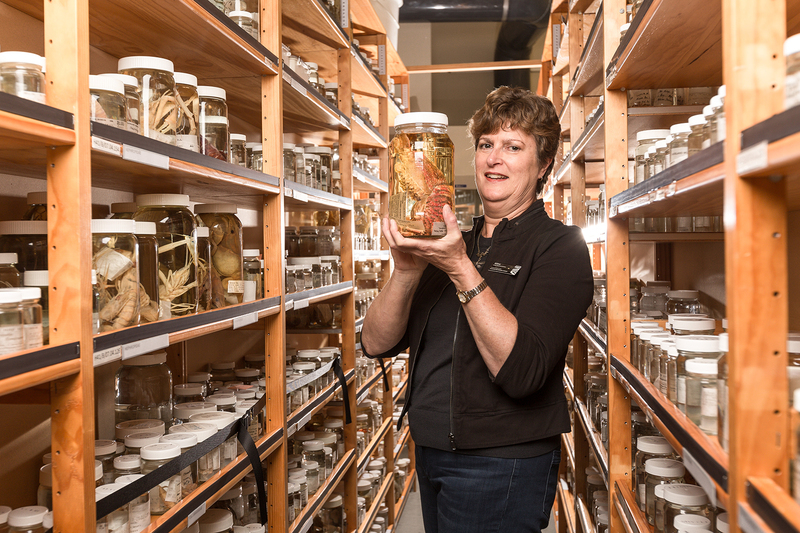 In order to help scientists with their research she may send hundreds of specimens offsite. She says although this naming technique has allowed her to become familiar with the cast of historical and modern day scientists and she’s honoured to join them, she prefers a characteristics-based approach to naming (e.g., spinosa if a species is particularly spiny; elongatus if it’s long and skinny; hirsuta if it’s particularly hairy) as it allows students and scientists to easily remember them. Our Curator of Marine Invertebrates, Wilma Blom, has spent much of her career identifying and classifying marine animals. 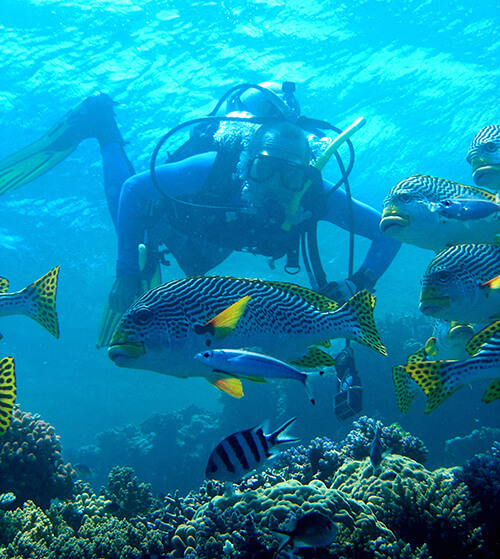 While at Sydney University, she studied southern Australian marine sediments for her doctorate and found a number of species new to science. These were made available for research to other scientists, who named five of the new species after her. Three of the new species are tiny single-celled foraminiferans. One of her favourites is the miniscule flask-shaped Lagena blomae. Though single-celled, forams are capable of making quite complex hard calcareous shells which often have small holes, hence the name foraminiferan, which means ‘hole-bearer’. They are extremely useful because they are readily fossilised. 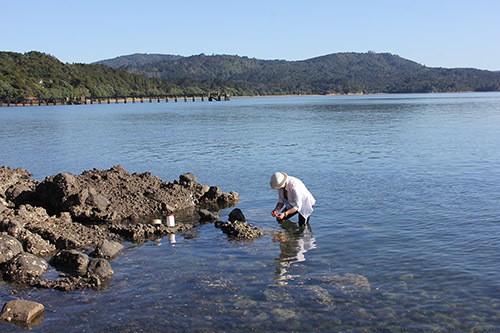 When extracted from marine sedimentary rocks forams can provide palaeontologists and geologists with valuable information on the age of the rocks and the ancient environments in which they were laid down. Seed shrimps, which also have a calcareous shell are equally useful for similar reasons. At last count in 2013, there were over 52, 517 native species living in New Zealand (including known undescribed species), and experts estimate there are around 65,000 species yet to be discovered. And although we’re discovering new species at a great rate, there are not enough taxonomists to describe and catalogue these species. For all organisms across the planet, it takes an average of about 20 years from first discovery to final naming and description. In New Zealand alone, there are over 8,500 species that are sitting in jars and canisters or on herbarium sheets, waiting to be processed. 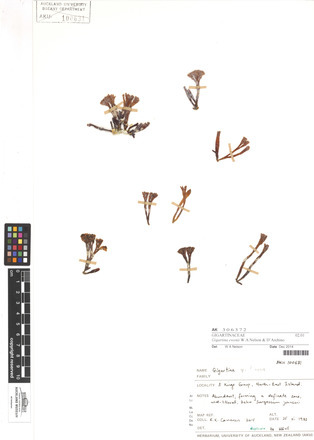 Advances in electronic publishing has enabled the mass conversion of data into formal descriptions, and imaging technology (such as 3D stacking) means digital specimens can be shared globally though these developments have done little to fill the scarcity-gap of taxonomists. In part, the reason for the time lag from species discovery to formal description is because scientists need to formalise how a new species relates to others, how it fits into a family or genus, so they generally have to do a revision of the wider group before it can be officially announced. And that takes time. This is where Museums come in. For taxonomists, Museum collections are of great importance to determine where a species fits within a genus, and a genus within a family. As well as holding vast stores of flora and fauna to help scientists solve taxonomic puzzles, Museums are one of the few bona fide institutions that can store type-specimens which are the standard representative of that species. By correctly cataloguing, documenting and carefully preserving these specimens, staff at Museums play an important role in helping scientists explain the web of life, past and present*. Currently, Auckland Museum holds over one million natural science specimens and hundreds of bugs, grubs, marine species and plants are added each year by way of donations and collection field trips conducted by our curators. For many of our natural sciences curators, discovering new species is part and parcel of their job. Surprisingly, though, it doesn’t take a trip into the deep, dark wilderness for them to discover new life. 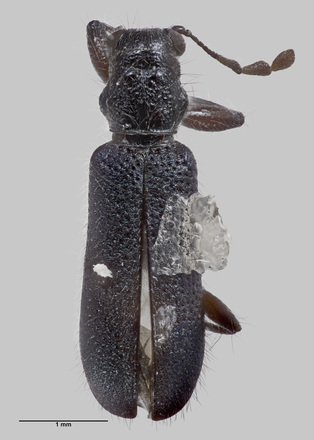 In Auckland Museum’s latest Bioblitz in 2010, the public uncovered around 30–40 new parasitic wasps alone – and that was conducted by families and kids around the Auckland Domain. So if you’re looking to play your part in scientific discovery, all you need to do is put your name down for a bioblitz. Who knows? You may end up with a biological namesake yourself. * Of course, gene sequencing can be very helpful in figuring out species’ relationships, but genetic studies alone cannot tell you everything about a species, and the vast majority of fossil species cannot be sequenced. Ancient-DNA studies are limited to the past few hundred thousand years, and then only for certain kinds of preservation, so having well-preserved physical specimens within Museum collections at hand is vital.